Britain’s biggest military spectacular, with over 1,200 performers, will celebrate its silver anniversary this year by bringing together marching bands, gymnasts, dog display teams, field gun and many other performers to the NIA in Birmingham. They will all join forces for this year’s 25 Birmingham International Tattoo on Saturday 30 November at 6pm and Sunday 1 December at 2pm. 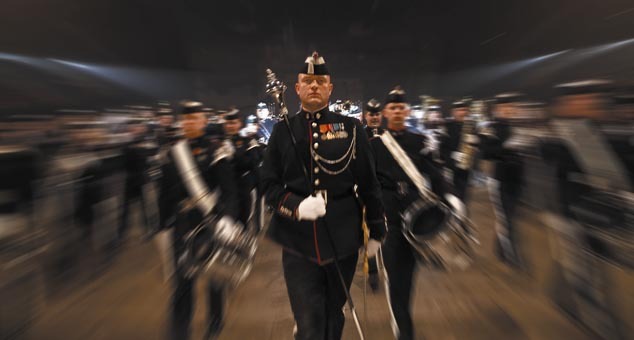 For this year’s special event, the organisers have brought together military bands from Norway, Belgium, Slovenia and nearer to home our own forces including the Royal Air Force. The Royal Air Force Band will demonstrate their musical skills in this special year which also marks the 70th Anniversary of the RAF Association. Representing the youth of the UK will be the Air Training Corps National Band and the National Youth Marching Band. Complementing the music of the massed bands will be the thrills of the exciting displays including the Inter-Service Field Gun Competition, one of the largest gatherings of Massed Standard Bearers from the Royal British Legion, the popular dog display and the Blue Falcons gymnastics display, plus a spectacular finale! What does RAF stand for? Send your answer along with your name, address and date of birth to competitions at fusedmagazine dot com. Deadline for entry is the 20th November. This entry was posted in Birmingham, Competitions and tagged 25 Birmingham International Tattoo, Birmingham, Competitions, NIA. Bookmark the permalink.